A view of Court Street Station above looking south toward Devonshire Station (State Street). 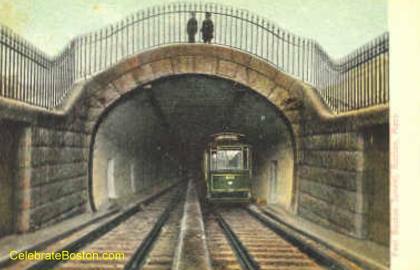 The original Blue Line, or East Boston Tunnel, opened on December 30, 1904. 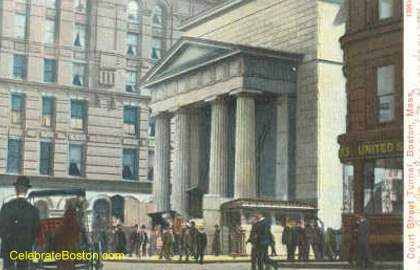 The line began at Court Street (near the Old State House), traveled east under Boston Inner Harbor, and ended at Maverick Square in East Boston. A one cent toll had to be paid to the state in addition to the transit fare. In 1916, the tunnel was extended to Scollay Under (Government Center, below the Green Line) and to Bowdoin Square. Court Street Station was then abandoned and demolished. In 1924, the line was converted to a third rail system, and the trolleys were replaced by rapid transit cars. 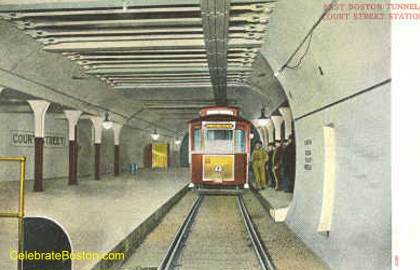 In 1952, the line was expanded to Orient Heights in East Boston, and to Wonderland in 1954. A view looking south on Court Street. The little kiosk at the center right is the entrance to the station. The Old State House is just east of this view. The pillared building in the center still stands and houses government offices. A view of Atlantic Avenue (Aquarium) Station looking north. 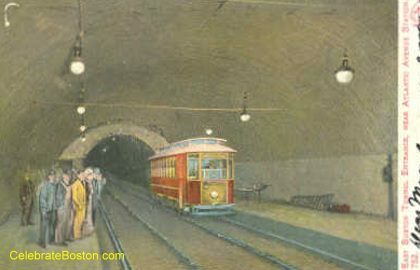 Atlantic Avenue opened on April 5, 1906, or more than a year after the main tunnel. It appears the station is unfinished when this view was produced. The tunnel is very deep at this point, just before it travels under the harbor. The Big Dig Central Artery Tunnel travels OVER the Blue Line near here, and is the highest point of the highway tunnel. A view of the subway entrance in Maverick Square in East Boston. In 1924, Maverick Square Station was constructed and "loops" were added. Rapid Transit subway cars perpetually traveled from Bowdoin to Maverick, with a loop at each end. Maverick Station contained 2 loops; one for the rapid transit cars and another for the trolley cars. Surface trolleys would travel into the tunnel, loop around, and then leave Maverick Station back to the surface. This greatly relieved surface traffic and allowed the trolleys to quickly turn around.